One of our eight apartments for rent in the new building in Pajsijeva st., Royal apartment in Belgrade is in downtown area, 200m from Republic Square, in a quiet street with no traffic, only 75m from the largest public square in Belgrade, Terazije, and 150m from the pedestrian zone of Knez Mihajova street. 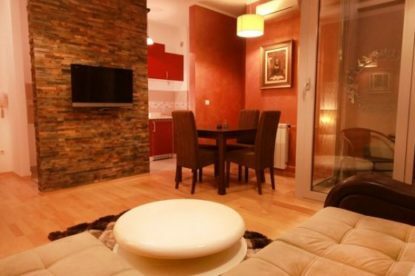 This Belgrade apartment is perfect for both business and rest and provides all the necessary round-the-clock services. 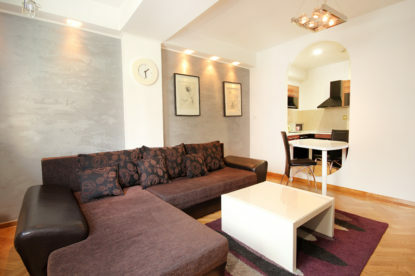 Also, it is on a convenient route to New Belgrade and close both to intercity bus station and Central rail station. 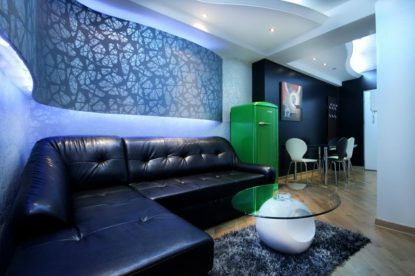 As an apartment for rent, it is well situated as a base for walking tours around Belgrade and has one reserved and secured parking space. Green market and many theaters and cinemas are nearby, as well as restaurants and nightclub scene in Savamala, which makes it the ultimateaccommodation in Belgrade. Royal apartment has an area of 90m², it is a three bedroom apartment designed and furnished in accordance with the highest standards. 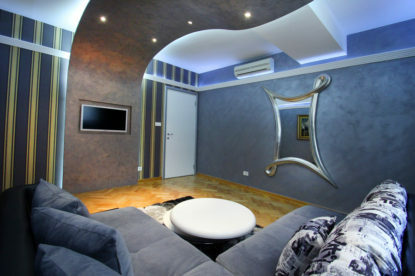 The design is of this luxury apartment is unique and inspiring, with an underlining tone of comfort and peacefulness. It is equipped mostly for a good rest and for a larger number of occupants renting an apartment, as it has one fantastic double bed with curtains in the first bedroom, one double and one single bed in the second bedroom and two single beds in the third bedroom. It has one bathroom and a separate toilet, as well as fully equipped kitchen. Apartment can provide best accommodation for up to nine persons, and up to six persons if there are to be no sharing of double beds.